Dodge, as he has been named for the moment, is a stray & is in the dog pound in Ireland. He will come into rescue if not claimed. This is all that is known about him at the moment but I will post again when more is known. It is not expected that he will be claimed. For more information please ring John 01932 571268. Dodge is not safe yet. 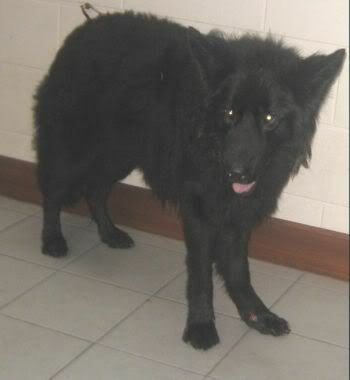 He is doing his time in Dundalk Pound at present and has an injured front paw. Lovely dog. He is being treated as a stray but really should not be. His owner left her rented accommodation and left him behind and the landlord fed him on an ad hoc basis for a couple of weeks. Fingers crossed that Dodge finds a loving forever home quickly, what rotten luck for him to have had such a sh*tty owner.